December 12, 2014 February 10, 2016 ~ Sara W.
As I have shared previously in my posts (Stroke of Luck, The Truthiness About Strength, and Living Cheerfully Amidst Trials), I recently suffered from a stroke, which led to a serendipitous find of a tumor in my optic nerve. The tumor is currently deemed as stable, thankfully. What I had not previously shared is that the tumor’s location is indicative of a tumor disorder called Neurfibromatosis Type 1 (NF-1). The long and short of it is that it causes a person to get tumors along the nervous system. The spectrum of the tumor disorder ranges from a benign tumor that creates no pain to cancer and chemotherapy treatments. I handled all that news okay. It wasn’t until I put together the pieces that my daughter is showing the starting signs of this disorder and it is deemed much more dangerous for kids, that I became heartbroken. However, I’m not here to discuss the battle that my daughter may or may not face. What I wanted to share was some uplifting insight I had regarding events tied to this knowledge of hers and my health situation. To understand my insight, you need to know that there is the potential for me to become blind and that my daughter may battle cancer before she’s eleven years-old. Those are our worst-case scenarios right now and neither are pleasant. That being said, I am currently not blind and my daughter currently does not have cancer. Right now we just have the possibility of such an outcome. Now, I have two options. Option #1- I sit here and worry about the possibility of the worst-case-scenario outcomes and hypothesize how long before things start to deteriorate in each of our bodies. In essence, I worry senselessly but try to pawn it off as though I’m just preparing myself for the future. Option #2 – I let my worry go and embrace the able body and mind that she and I currently have. In case you haven’t figured it out, I’m opting for the latter. 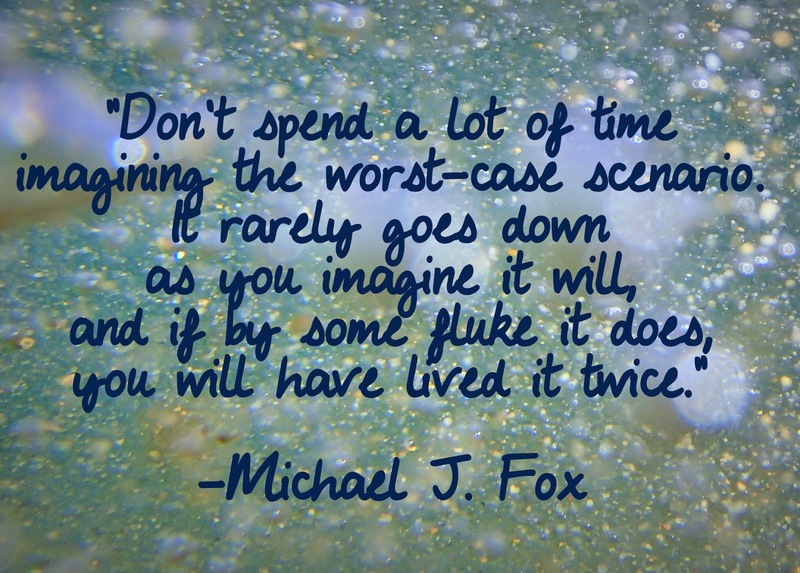 I was having this discussion with a friend of mine and she shared with me this awesome quote by Michael J. Fox that speaks to this matter, “Don’t spend a lot of time imagining the worst-case scenario. It rarely goes down as you imagine it will, and if by some fluke it does, you will have lived it twice.” This quote from a man who has suffered from Parkinson’s Disease for over twenty years and still continues his role as an actor and, now, an advocate for the disease. Proof that we can’t let our worst-case scenarios keep us from living to our full potential. This came to my mind again yesterday, as I drove my daughter three hours to the closest pediatric specialists available. My daughter has become terrified of doctors ever since she underwent her second eye surgery two years ago. As a result, my husband and I did tell her that they might need to do some tests, but we did not tell her that the tests would include them drawing her blood. We didn’t see the point in having her worry about it for days. I finally told her in the lab waiting room and as soon as her name was called she went into panic mode. I physically dragged her into the lab, fought to get her jacket off, braced her down in my arms, and stayed strong while she yelled at me, “MOM! LET ME GO!” Once the needle was in and she realized that it wasn’t that bad, she immediately calmed down and said, “Sorry; I was scared. It was my first time.” I had tried so desperately to explain to her that she was making it worse by freaking out and that it wasn’t nearly as bad as she thought it would be, but she just couldn’t believe me. I even tried to reference the last time she freaked out at the doctors when her eyes needed to be dilated. I reminded her that her tantrum then didn’t change the fact the dilation was going to happen, just as this blood draw was going to happen regardless. She could either go about it calmly or freak out and make it worse. Unfortunately, she chose the latter, but she assures me she will not freak out next time. These events served as a confirmation that I don’t want to waste time worrying about the worst-case scenario. I fell into this trap before when I was mourning my mom’s death while she was still alive. I was wasting time fretting about how I wouldn’t survive once she was gone, instead of enjoying all the beautiful time that I still had left with her. I’m thankful that I learned this lesson then, so that it could prepare me for the situation I currently find myself in now, where it would be so easy to cry over the possibility of me going blind and not see the life I currently live before me (pun intended). My goal is to somehow instill this same lesson in my children’s hearts and hopefully save them some angst down the line. This way of thinking has proved freeing for me. I worry about the future from time to time, just as the next person, but somewhere along the way, I learned to embrace the present as well. Right now, my daughter does not have cancer and I can see the world around me and that is a glorious feeling. And if, by chance, she does get cancer and I do go blind, at least I can take comfort in knowing that I didn’t waste the time leading up to those events. Plus, I will hopefully have gained a better understanding of the power of a positive attitude and use that strength in whatever battle me or my loved ones will have to face. I could stand to live in the present. What a wonderful quote by Michael J. Fox! I feel as though I lived through so many horrors that may or may not have actually happened! I love that little girl of yours & I’ll keep you guys in my prayers. Sara, what a beautiful post. I cried all the way though it, because I HAVE seen how you have CHOSEN to embrace today and live it fully. What an incredible example you are to all of us. Thank you, dear friend.